To advise – we must first understand. At PMK we do understand. Our approachable team of qualified accountants and technicians have over 100 years of relevant experience across all sectors. Led by our senior team, we work with business owners to install bespoke internal controls, while designing and maintaining an internal accounts function that will provide timely and accurate management information. This gives peace of mind to business owners that not only are their statutory requirements under control; they are getting high quality and focused information to run their business. Our staff continuously receive training to ensure that they are completely up to date on accountancy, tax and sector knowledge, making sure that we keep you ahead of the game. Restructure their business where necessary to cut out poor performance and improve productivity. We spend time getting to know the personal plans and ambitions of our clients, the business owners, so that we learn what their personal and business aspirations are and through careful planning and advice, help with achieving them. We focus on providing exactly the right service for our clients and their business and one that is tailored to their needs. Our aim is to ensure that all our clients run their businesses compliantly, cost-effectively, profitably and tax efficiently. 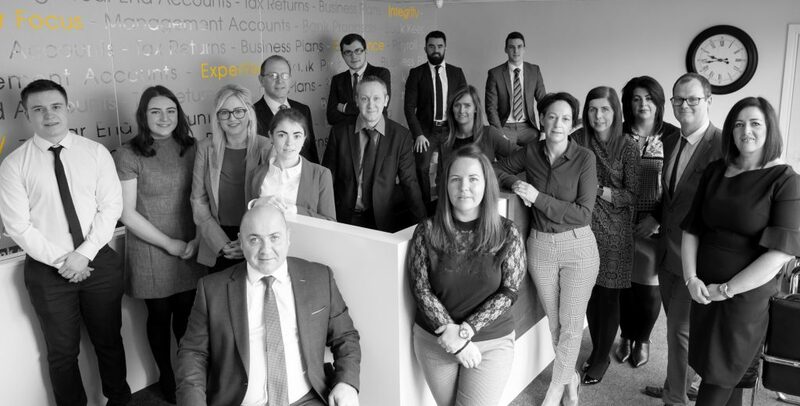 By practising what we preach, our own business has grown considerably in recent years, resulting in a move to our current office where we have grown PMK team from 5 members in 2013 to our current compliment of 17. At PMK Accountancy Services, we help businesses of all sizes from small sole traders to SME’s. We have developed expertise in a number of core sectors and we are recognised as a leading advisor in the retail market by the three main independent retailer wholesalers Henderson Food Service, Musgrave Retail Partners and NISA. We also provide accounting, taxation and consultancy services for the construction, manufacturing, dental, legal, agricultural, transport & logistics and property sectors. Being open, honest, respectful and acting with integrity at all times is indicative of how we do business. We provide financial information and consultations in a friendly professional manner. When you partner with us you can be certain of sound, qualified advice based on years of experience, regardless of your size, the type of business you operate or the level of support you need from your accountants. Family – you do business the same way you live your life. Family values determine the way in which business is done in PMK. We look after each other and our clients; we are welcoming, approachable and friendly at all times and maintain an ethos of positivity, enthusiasm and fun. Professional – we deliver a high quality unique and bespoke service to our clients. Loyalty – We are loyal to ourselves and our clients and focus on building and maintaining trusting, confidential and secure relationships with clients and colleagues. Honesty and Integrity – Doing business honestly, being honest with each other, being respectful and sincere. We always try to do the right thing. Reliability – We do what we say we are going to do every time! And we deliver what we promise every time! Being truly honest with our clients can be challenging because we tell them what we think, rather than what we think they would like to hear which can sometimes be hard for them to accept. However, we have found in all cases that this is the best way for both our clients and for us to succeed, therefore we remain confident in our approach. With a First Class BA honours degree in Accounting & Finance and with over 20 years’ experience of working in both practice and Industry, Paddy formed PMK Accountancy Services in 2005. Paddy has developed a specialised knowledge of the Retail sector that is invaluable when assisting clients in maximising profit margins. Through working closely with his clients, Paddy learned that the insertion of the necessary internal controls and constant measurement of performance is required to ensure that all businesses are managed efficiently and performance is maximised. Paddy has applied this practice to clients in all sectors and of all sizes and has instilled it into the service that PMK offers giving him confidence that PMK will make a difference to the bottom line of any business. Paddy has created an organisation with a culture that cares about the performance of our clients businesses. Frank is an FCA with just over 20 years’ experience. Frank trained and qualified in a small practice in Newry and then worked in industry for two years in the food manufacturing industry as Financial Controller before going back into practice in 2006. Whilst working in industry Frank worked on creating bespoke management information systems and on manufacturing process and throughput control. Frank has gained extensive experience with Preparation of Financial Statements, Audit, Management Information Systems, UK & ROI Tax Compliance and Planning, Business Consultancy and was also the Financial Controller of the practice. Frank has worked with all types and sizes of clients across all sectors, both sides of the border. Frank enjoys working closely with clients on their businesses and is responsible for providing business consultancy services, exploring the financial performance of the business and investigating any variances from expected results. Sinead qualified as a Chartered Accountant in March 2003 and is an FCA with a BSC in Accounting. Sinead worked in a local accountancy practice for 16 years until 2015 at which time she then joined PMK as Practice Manager. Sinead has substantial experience & knowledge in all areas of practice work, including Capital Gains Tax, Inheritance Tax Planning, Corporation Tax, Self-Employment Tax and Preparation of Financial Accounts. Through her current role in PMK she has gained extensive knowledge of the retail industry and can help & advise clients on procedures to try and increase their profit margins and to improve their internal controls and information systems. Cathy qualified as an Accounts Technician with the IATI in 2007 and went on to qualify as a Chartered Accountant with ICAI in 2011. After gaining 10 years’ experience in a local accountancy firm working in accounts and tax departments on a wide range of business types and sizes, Cathy joined PMK in 2015 as a senior accountant. Cathy delivers a wide range of services including providing management accounts, business support and tax advice and manages a portfolio of clients. Dermot received his BA Hons degree in Accounting and Finance from Griffiths College Dublin in 1998 and afterwards trained in an accountancy practice in Dublin for 4 years before moving to industry where he worked as a company accountant and then Financial Controller of a Retail business for 8 years. Dermot has the honour of being the first employee of PMK and has assisted Paddy with growing the business to where it is today. Dermot has worked on nearly all clients at some point of their journey with PMK and has been involved in all service areas which PMK provide. Dermot maintains his own portfolio of clients where is the lead PMK advisor and with whom he works very closely with on the management of their businesses. Martha qualified as Chartered Accountant in 2007 and is an FCA with Chartered Accountants Ireland with a BA Hons in Accounting. Martha trained and worked with an accountancy practice based in Newry, working there for 14 years when she joined PMK. Martha has worked with clients of many types, in many sectors and of various size and has in-depth knowledge and experience of Preparation of Financial Statements, Management accounts preparation and reporting on KPI’s, Personal and Corporate tax compliance. Martha manages the delivery of management accounts for a portfolio of clients of PMK and enjoys a great working relationship with our clients and their staff. Sharon joined PMK in 2013 as an Accounting technician and is now Payroll Manager. Sharon works with many clients, some who have very complex payrolls. She has gained a wealth of payroll knowledge over the years and always keeps up to date with any new regulations or requirements. Her industry experience means that she can give the best advice to our clients on how best to meet their payroll requirements. Rosin joined PMK in 2014 after graduating from University of Ulster Jordanstown with a 1st Class Hons in Business Studies. Roisin has gained comprehensive knowledge in the completion of Management Accounts for clients in the retail sector. Roisin also is responsible for Payroll and VAT compliance for many of our clients. Ross graduated from Queens University Belfast with a BSc in accounting in 2016. Ross began his ACCA training with PMK in October 2016. Ross manages a portfolio of clients within the retail and transport industries and works on Management Accounts preparation and other support roles. Caoimhe joined PMK as a trainee Accounts technician in June 2017 after completing her A Levels. Caoimhe is currently in year 2 of the Accounting technicians Ireland HLA programme. Caoimhe works on accounts preparation and tax returns and also has responsibility for VAT and payroll compliance for many of our clients. Kealan joined PMK in 2017 as a bookkeeper after having worked for a number of years in the confectionary industry. Kealan works on accounts preparation and tax returns and also has responsibility for VAT and payroll compliance for many of our clients. Michael worked as an Accounts assistant within the construction industry for 2 years before joining PMK in January 2018. Michael is currently in the 2nd year of Accounting Technicians Ireland Course. Michael works on all aspects of bookkeeping and Management Accounts preparation for a number of key clients within the transport and retail sector. Matthew completed his A-Levels in June 2018 and joined our team in August. Matthew was accepted on the Accounting Technicians Ireland HLA programme and is currently studying in year 1. Matthew is gaining hands on experience in all areas of accountancy. Aoife joined PMK in 2018 after having been offered a place on Accounting Technicians Ireland HLA programme. Aoife decided to pursue a career in accounting after completing her HNC in Business studies. Aoife works on many aspects of Management Accounts preparation, bookkeeping and gaining hands on experience in Final Accounts preparation. With over 20 years of experience in customer facing roles Karen joined the PMK team in May 2018. Karen provides administrative support to the PMK team, as well as PA duties to the company Directors. Maire joined PMK in 2011 as Human Resources Administrator. Having graduated in 1999 with a degree in Business Studies Maire took up a career in recruitment and spent 10 years in that industry. Maire is responsible for all human resources and recruitment matters in PMK and also assists with the general administration duties. Tiarnan joined PMK in the summer of 2018 to gain work experience while studying Accountancy in Queens University Belfast. Tiarnan remained after the summer as a part time member of the team after returning to university and assists with Bookkeeping and VAT compliance work.